Save BIG when you register for the full weekend with Kerry Armstrong. Come take a journey to your heart. During this vinyasa flow class we will work through several lengthening and opening leg poses that will give you access to your hips. Your hips are a huge storage unit for emotions, we will dive gently and deeply into the layers of the hips to help dissolve any old energy. From the hips, we will take a journey to the heart. Layer by layer, we will uncover anything that is blocking you from your fullest expression of love and clear out any emotional blocks. We will open the heart through an intentional back bending sequence that will leave you feeling open, receptive, and connected to your highest possibilities once again. This workshop will tackle a wide array of arm balances in a way that will dissolve fear and create lightness and playfulness! Emphasize the cornerstones of successful arm balances and inversions and discover a strong core and open shoulders. This workshop is open to students of all levels looking to grow stronger in their practice. 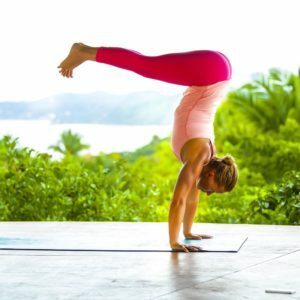 Together, we will learn the essentials to have you soaring into poses such as crow, side crow, forearm balance, handstand, chin stand, classical headstand, eight-limb pose and many more. Bring your curiosity and we will soar together in these striking asanas!